So Amara was saved. But in the south of the Old City something nasty is happening. The busiest road within the city walls has been closed for the past year, as it is ripped to pieces. 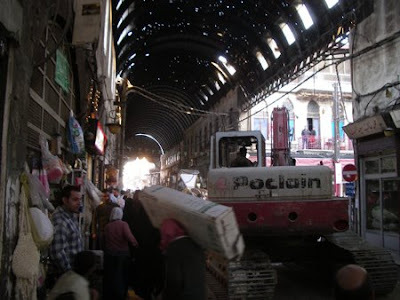 Walk along Medhat Pasha - called Straight Street in the Bible - and bulldozers are tearing up the ground, and look to your left and right to see the shops being gutted. Essentially, a new Medhat Pasha is being built. Whenever I walk along there, I am staring at the ground - trying not to trip over the rubble. Looking up at the roof is not an option. But maybe you should. Here it is six months ago, with the old roof. Of course, the Old City can't survive on memories. It needs to be renovated to keep living. But the Old City is heaving under the weight of the bulldozers which have been brought in. Early on in the work, the digging destroyed a much-loved bar at the eastern end, Abu George. Metal rods now hold up the neighbouring buildings to stop more walls collapsing. The cobbled stones on the ground have been laid along parts of the road - only to be ripped up for a second time. Shoppers and shop-owners compete for space with the workmen. The shops are still open - life can't be put on hold. It's not just the exteriors that are being brought into the 21st century - all of the shops are being refitted. The authorities are paying for them to be gutted and refurbished. 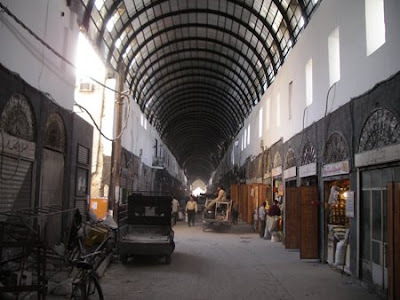 A similar scheme improved the tourist souq alongside the Omayed Mosque a few years ago. 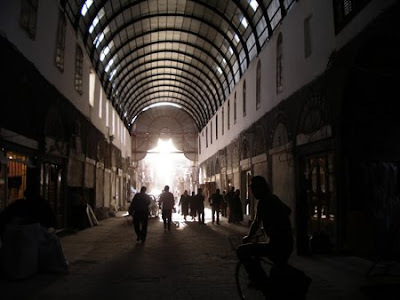 Damascus is a living city, not a museum piece. So as much as work like this is disruptive, it is vital. When the dust settles - and there is a lot of it - a new Medhat Pasha will emerge. One in keeping with its glorious history, but fit for life in the twenty-first century. Next week, in part three - official documents hint that a thirty-year-old plan to force residents out of one of the oldest parts of Damascus - and build tower-blocks - could be put into action within months. many thanks sasa for this report. 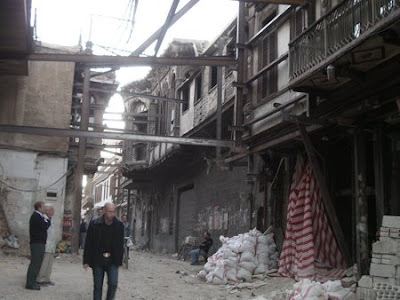 It's very sad that often restoration in syria is synonym of destruction of what is guenine and nice and replacing it with something of hollywoodian concept of 1000 nights and night.It lost harmony and its historical values. I admire your courage for going there. I don't think I am able to do it without having a heart attack out of sadness and despair. Thanks for your comments. I tried to end on a positive - it is an absolute mess now, but the work will eventually be finished. I don't think the style is being changed at all - except for the roof, which I am devastated about. It's not going to be some Solidere DOwntown Beirut. I think - and hope - that it will be hard to notice the difference once the work is finished, except that it will be cleaner and stronger, and able to last another 100 years. Don't despair. Thanx for the roundups sasa, greatly appreciated. We need a lot more of these conservation projects. I just hope they're not doing one thing to distract us from other plans to destroy another. Anyways, It's good to know that the old city is getting a face lift. 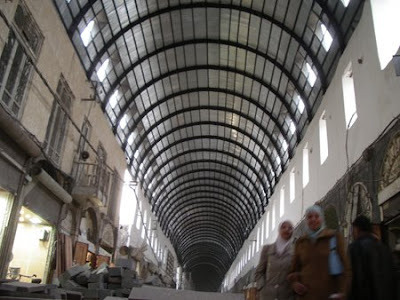 I hope it'll be better than the job they did with the umayyad mosque. Btw, have you been to the airport recently? do u notice any change, I've read about some revamping going around, can you confirm that? 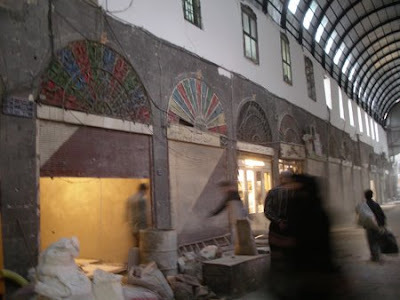 Well, one thing is for sure, the 'conservation' is happening with an amazing pace across the whole of the Old City, although not on as big of a scale as in Medhat Pasha. Most of it is with EU funding. I heard that some renovations were going to take place at the airport while it was closed for the Arab Summit two weeks ago. (Because the foreign heads of state didn't use the normal passenger terminal - there is a 'VIP' terminal on the right hand side). I haven't been since then - I will have to go and see what's new. There were rumours of the whole place being rebuilt soon - I don't think that's happened yet. I spent the day walking around the Old City with a few old friends, two of whom are here studying Arabic. First stop, the Souq al-Hamidiyya — a wonderful 2000-year-old marketplace, with a vaulted black roof that has been punctured by rocks (or just the passage of time?) so that the sunlight streams through in pinhole shafts. Kids play in the center of the walkway, wearing Spider-Man T-shirts (Marvel Comics has no borders) and setting off fist-sized toy helicopters propelled by rubber balloons. When they're released, they scream twenty, thirty feet into the air, squealing all the way, until they exhaust themselves, and fall back to the walkway where the kids pounce on them like bird dogs. A few blocks south of here, there's a street called Medhat Pasha — or, "the street called Straight," as it's named in the Bible. It is the actual Road to Damascus . It's where the Christian-killing Saul of Tarsus was said to be blinded by God's light, converted to Christianity, and then healed by a man named Ananias (Acts 9:10-19), whose house is a few blocks away from here." These words of Haley Edwards commenting here hibernal visit to Damascus in the Seattle times made me think once more about the story to be told about the Syrian resistance during the French mandate, assuming that the author's story about the shafts in the article you send me is true. However, I wander what other alternative could have been put forward? (If not on the government side, at least, by independent heritage advocates or institutions). Of course, It's note of my intention to blame the activists, such as yourself, but referring to them as reactive rather than being proactive is only true as there's, in fact, nothing left to do after the works have taken place. Yet, a consoling factor remains that such actions are not considered to be of any violation to UNESCO's norms and practices, otherwise, local authority's reaction would have been completely different. The one thing I do admit at the end is the admiration I have for your enthusiasm. 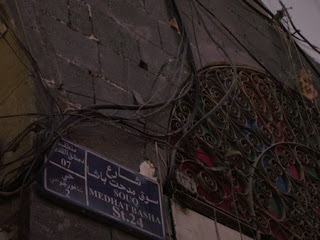 the most interesting parts of the old city are located outside the walls ,like midan in the south and saroujah,salhiyeh in the north ,is there any conservation works in these districs?. Thanks Amira for that. It was very interesting. Anon - I will be writing about that soon. Although technically, these aren't parts of the Old City, because they aren't as 'old' as the areas inside the city walls. i can't believe these terrible pictures. they look like a decore for a new syrian series!